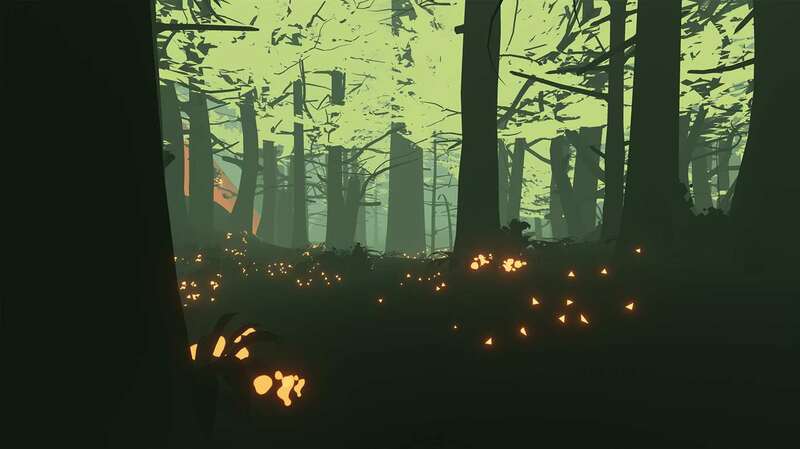 Shape of the World is a procedurally generated walking sim / first-person-exploration game where the world springs into life around you with every step you take. There are no enemies to fight or even a story to follow. The whole point is just to walk and explore and see more of the beautiful world and it is absolutely lovely. It won’t be for everyone, even less so than most walking sims if we’re being honest, but if you want a great looking and relaxing game to use to try to get away from the stresses of the real world, Shape of the World is fantastic. See our full Xbox One review for more. You start Shape of the World in a stark white location with nothing in it but a glowing triangle beckons you forward. As you pass through the triangle, a blast of color suddenly starts filling in the details of the world and every step you take causes more of the world to start building itself around you. The world is simple at first but gradually adds plants and water and eventually all sorts of different animals and it is absolutely gorgeous. 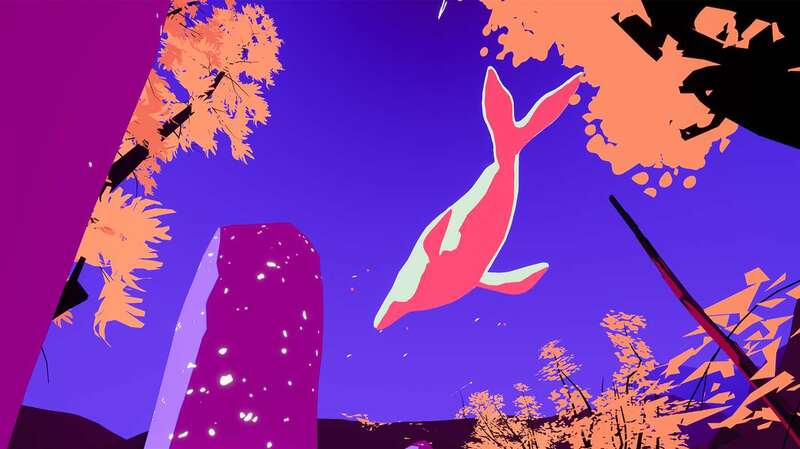 The game is not realistic looking, though, and instead uses flat polygonal shapes with no textures painted with vibrant bright colors. It looks awesome. There is no real objective in Shape of the World other than to just walk around and explore, but you are lightly guided along by more glowing triangles in the distance. By making you way to these triangles and walking through them you change the color of the world as well as let you move on to the next biome. You start out in a valley and work your way through a forest, volcanic area, underwater cave, and more until you eventually reach the summit of a mountain and the game ends. This is one of those games where the journey itself is the important part and not so much the destination or even why you're going there. 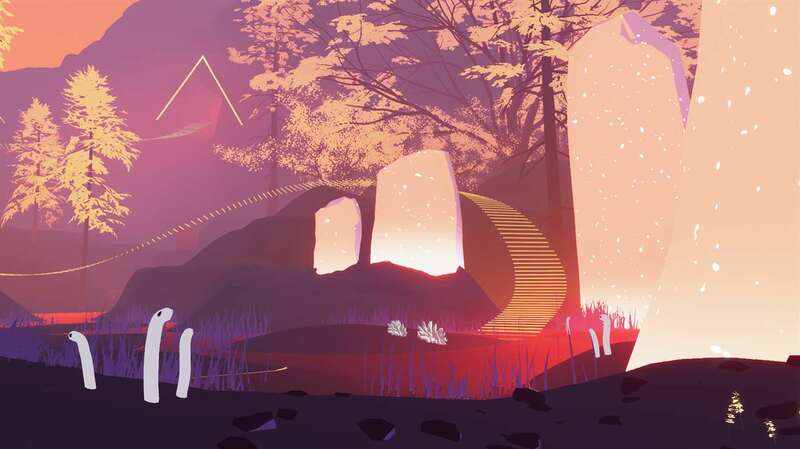 You’re playing Shape of the World just to experience a walk through a stylized bit of nature and see beautiful things. For me, that’s plenty. For gamers that need more excitement, maybe this isn’t the game for you. Gameplay in Shape of the World is fairly simple first-person exploration. There isn’t much to "do" in the game, however, though there is some basic interactivity that organically pulls you forward so you make progress while not seeming too videogame-y in the process. As you play you collect seeds and by throwing these seeds you plant trees. Interacting with trees make you move faster, so you can plant a long line of trees in order to move quickly through an area. Progress is made by either walking through glowing triangles as mentioned above, or by interacting with glowing stones. These glowing stones – usually 4-5 in an area – create a vibrant staircase when you interact with them all and by following it you get to the next area and chunk of progression. Later in the game new glowing stones with holes in them appear and by interacting with these you are flung high into the air so that you can reach new areas. And that's kind of it. The “platforming" at the end of the game where you're using the stones with holes in them to fly around is the only real excitement (and potential frustration since you don’t always go where you want) in the whole game. The journey through each biome and seeing all of the colors and new plants and animals popping up with every step you take is the reward here, and it does a fantastic job. The game is serene and peaceful and spectacular and wonderful. Honestly, it does a far better job of letting you experience nature and relax than Walden, a game did. The presentation in Shape of the World is the main attraction, and it is fantastic overall. The simple geometry covered in vibrant colors works extremely well. You always know what you’re looking at, even if it doesn’t necessarily represent real life. Because the game is procedurally generated things will occasionally clip through each other or you’ll see the seams of the world, but for the most part it hold together. The music is also fantastic and swells to a fantastic crescendo as you reach the mountaintop at the end. All in all, Shape of the World is gorgeous and a joy to play and if you enjoy walking sims or just casual relaxing strolls through beautiful games like Abzu or Journey, it is well worth checking out. It’s not exciting and doesn't tell a deep story to compel you to play, so it won’t be everyone's cup of tea, but for those of us that “get it”, it is wonderful. It isn’t a long game – playthroughs can be as short at 35-minutes or as long as a couple of hours, but it does have decent replay value since it is procedurally generated. I had a great time with it overall and it is one of those games you'll want to show off to non-gamers, which is always fun. Shape of the World is unique and beautiful. Buy it.